If you cannot log in to your ConfTool account or have problems creating a new user account, please consider the following hints. Please also note that you always find the contact e-mail address of the responsible conference organizer in the lower left corner of every ConfTool screen (see image 1). Firstly, please note that the user name and the password are both case sensitive, i.e., “peter” and “Peter” are two different user names and/or passwords. Furthermore consider that some letters and numbers look quite similar, e.g., the capital letter “O” and the number zero “0” look alike but are different symbols. You have used another e-mail address during the registration process. Please also try your other addresses. You do not hold an account with this ConfTool instance. Usually each conference has its own user database, so if you registered for one conference, you will have to create a new account for other conferences. There was a typo in your e-mail address when your account was established. Please contact the conference organizers, they will be able to update your account data. You hold two user accounts (usually with two different e-mail addresses). merge duplicated accounts (if required). They (usually) cannot send you your password, as it is encrypted. So if you know your user name, but your password does not work, please use the “Forgotten your password?” link (see image 2). You will get an e-mail to regain your password. If you are really stuck, the conference organizers can also set a new user name and/or password for you and send it to you. 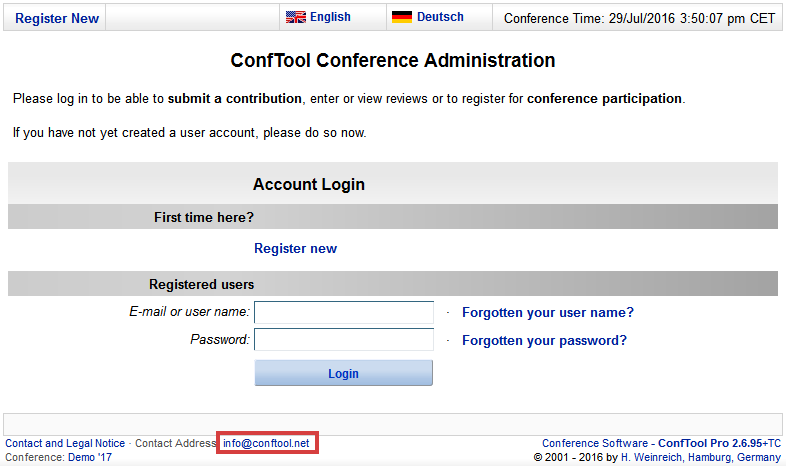 To create a new ConfTool account, please click on “Register new” on the login page (see image 3). Please fill in all fields marked with an asterisk “*” before the label of the input field. If you already hold a ConfTool account for this conference, do not create a second account for the same event in ConfTool. For example: If you have already submitted a paper, please use the same account to register for conference participation, too. If you try to create a second account with the same e-mail address, you will get a corresponding error message. In that case, please use your e-mail address to regain your user name and password if you have forgotten them (see above). Please note: In some cases organizers have decided to allow users to create several accounts with the same e-mail address; also in these cases, please use the same account for all actions related to one person. The e-mail address must be valid. ConfTool does several tests to ensure that you enter a valid address to avoid typos. Your e-mail address will be used to contact you about the event, the submission process and the participant registration process. The user name has to consist of at least 2 characters, is case-sensitive and must be unique, i.e., no other ConfTool user must already be registered with the same name. The password has to consist of at least 5 characters, is case-sensitive and has to contain at least one Latin character (a-z) and one number (0-9). The password must not be simplistic, for instance it must not be equal to your name. If you have problems creating a user account, please contact the conference organizers by e-mail and include all required data. The conference organizers will be able to assist you.